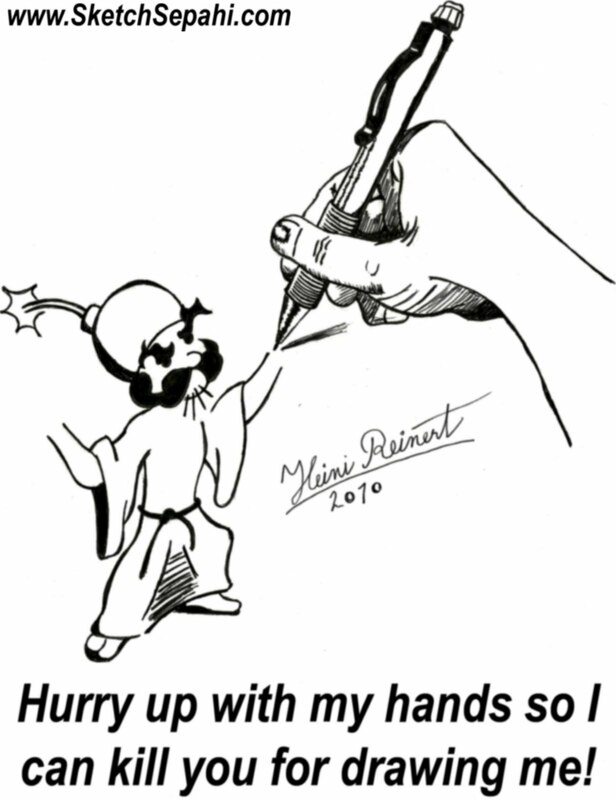 Frihet: Every day is draw a Muhammed day! Bombemannen i går hadde som mål å sprenge Jyllandsposten. Samme grunn som de har truet for i mange år. De publiserte karikaturtegninger av Muhammed. Trodde de var tilgitt etter redaktøren sa unnskyld å publisere tegningen, og artisten Kurt Westergaard ble presset ut av Jyllandsposten. Ekstremister glemmer ikke og de tilgir ikke, Jyllandsposten må dø. Vold sensurerer bare delvis, vold og trusler som sensur, kan i verste fall slå tilbake som vi så under "Everybody draw Muhammed day". Da stod store deler av den vestlige verden opp for ytringsfriheten. Vi må vise at vi ikke godtar ekstremisme. Grunnprinsippene i et demokrati bukker ikke under for vold og trusler. Heldigvis har jeg mer tiltro til det danske politiet enn til det svenske og norske. I Danmark etterforsker de slike saker, i Norge og Danmark blir det lagt "på is" til det blir glemt av befolkningen. I Danmark har regjeringen oppfattet innvandringproblemet og har innført en mye strengere innvandringspolitkk enn Norge og Sverige. "Grunnprinsippene i et demokrati bukker ikke under for vold og trusler." Karikaturstriden viste at vold og trusler er langt mer effektivt som politisk virmemiddel enn stemmeseddelen, også i Norge. Vi mangler rett og slett politikere som betingelsesløst er villige til å forsvare Grunnloven. Danmark har våknet opp i forhold til de religiøse islamske facistene. Tror nok Norge og Sverige følger etter ja. Ja, jeg er enig med bloggeren: Every day is draw a Muhammed day! Våre nye landsmenn stemmer stort sett rødt. Uten deres stemmer ville vi ikke hatt en rødgrønn regjering idag, for det er det fargerike fellesskapet som holder Stoltenberg og Co. ved makten, og da kan vi nok se langt etter en endring i innvandringspolitikken i inneværende stortingsperiode. How can some people justify killing people over cartoons? Do you think the muslims who insults christians should be shot too? And how can you justify death threats, when you think drawing should be punishable by death? It's really a cool and useful piece of info. I am happy that you just shared this helpful information with us. Please stay us informed like this. Thanks for sharing. I loved as much as you'll receive carried out right here. The sketch is tasteful, your authored material stylish. nonetheless, you command get got an nervousness over that you wish be delivering the following. unwell unquestionably come further formerly again as exactly the same nearly very often inside case you shield this hike. I usually do not leave a leave a response, however after reading a few of the remarks on this page "Every day is draw a Muhammed day!". brain dead individuals? :-P And, if you are writing at other places, I would like to keep up with anything fresh you have to post. I'll immediately grasp your rss as I can't in finding your e-mail subscription hyperlink or e-newsletter service. Do you've any? Kindly allow me recognise so that I may subscribe. Thanks. suppose you added a little content? I mean, I don't wish to tell you how to run your blog, however what if you added a title to possibly get people's attention? I mean "Every day is draw a Muhammed day!" is kinda plain. You should look at Yahoo's home page and see how they create post titles to get viewers to click. You might add a video or a related pic or two to grab people interested about everything've written. writer but I'm still new to everything. Do you have any tips and hints for rookie blog writers? I'd definitely appreciate it. You have done a formidable activity and our entire neighborhood might be grateful to you. this take a massive amount work? I've no expertise in computer programming however I was hoping to start my own blog in the near future. Anyway, should you have any recommendations or tips for new blog owners please share. I understand this is off subject nevertheless I just had to ask. Appreciate it! There's certainly a great deal to know about this issue. I love all the points you have made. that how a user can understand it. Thus that's why this paragraph is amazing. Thanks! you using for this site? I'm getting fed up of Wordpress because I've had issues with hackers and I'm looking at options for another platform. I would be great if you could point me in the direction of a good platform. Hurrah, that's what I was looking for, what a stuff! present here at this weblog, thanks admin of this website. It's perfect time to make some plans for the future and it is time to be happy. I have read this post and if I could I desire to suggest you few interesting things or tips. Perhaps you could write next articles referring to this article. I want to read more things about it! What's up, its fastidious post about media print, we all understand media is a impressive source of facts. Nice post. I was checking constantly this blog and I'm impressed! Very helpful information particularly the last part :) I care for such info a lot. I was looking for this particular information for a long time. Thank you and best of luck. Every weekend i used to pay a quick visit this web site, as i wish for enjoyment, since this this website conations actually fastidious funny stuff too. It is perfect time to make some plans for the future and it's time to be happy. I have read this post and if I could I want to suggest you some interesting things or suggestions. Perhaps you can write next articles referring to this article. I desire to read even more things about it!